Terrible weather at the canyon so visibility was only 150 feet. Terrible weather at the canyon so visibility was only 150 feet. Other than that the tour was good. We actually went on the best of Kauai tour, which included Waimea Canyon and the Fern Grotto and a cruise on the Wailua river. Given the choice I would probably just do the Waimea Canyon tour on its own. It is amazing. Oh, so beautiful! It&apos;s called the Grand Canyon of Hawaii, and it&apos;s even more colorful than our amazing Grand Canyon of Arizona. Our driver had wonderful stories and narration to tell us on the way up to the canyon. Our driver had wonderful stories and narration to tell us on the way up to the canyon. We also enjoyed the stops for coffee and the spouting horn on the way back. Very glad we booked this tour. Bus broke down but good tour. Our guide was very entertaining. Our guide was very entertaining. Made several small stops before the Canyon. This area is so beautiful. We had ample time to explore and even grab a snack. The drive is as beautiful. Made a stop at the blowholes. Great tour guide, great tour with beautiful sites. Great tour guide, great tour with beautiful sites. My favorite of all the islands. Unforgettable experience. All the tour guides we had from Polynesian Tours were wonderful but this one was exceptional. Informative and entertaining; excellent transportation and guide -- just the right pace; appreciated the experience and would recommend it. The price was right! Excellent tour and great tour guide. We stopped off at the first lookout which was our first look at the canyon. We enjoyed a couples of hours driving in and around Kauai before arriving at Waimea Canyon. 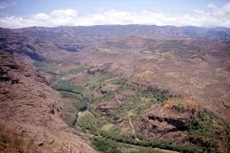 We loved the Waimea Canyon which is called the Grand Canyon of Hawaii. The picked us up once again at the ship and took us to Waimea Canyon. This was the best excursion we took on the trip. This is the only â€œbig busâ€ tour that I took. What a great way to see Kauai. What a great way to see Kauai. Can&apos;t say enough good things about this tour and our wonderful guide Rick. We went to Waimea Canyon, ate a picnic lunch, and beautiful part of Kauai including Spotting Horn. First Class trip to Waimea Canyon the Grand Canyon of Hawaii. Excellent tour and excellent driver / tour guide. Very beautiful place. Great scenery.